The Hockey Song, Blame Michael Geist? Just submitted the following comment to The Creators’ Copyright Coalition article The Hockey Song? Blame Michael Geist. I’m often just as apt to do it, but it fascinates me how different people interpret the same vents differently. Remember your semiotics, all meaning is negotiated! Your article doesn’t make clear how refusal to pay for something and then not using it (in this case the Hockey Song) is anti-copyright? I thought it had something to do with payment/permission for use and no use without it – the CBC’s not even trying to argue a fair use/fair dealing situation. Unless the only thing copyright stands for is paying people, and if that’s the case then I submit that its in fact you who’ve fallen into the “kid downloading an MP3 mindset”. In any case, thanks for contributing to the public dialogue. Ironically, the op-ed posting on the educational exceptions of Bill C-611, Straw in the wind: the mindset behind C-61, is bang on. Want to send Grandma a DVD (OK, maybe play for her a DVD) of the latest baby pictures with your favourite Beatles songs in the background? 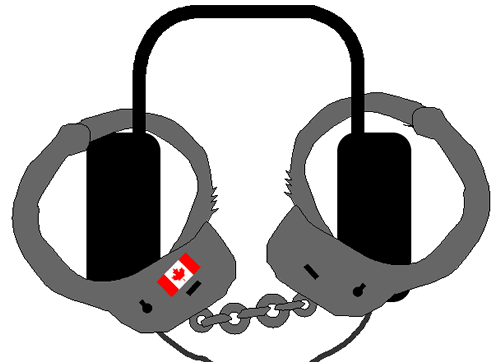 If Canada’s proposed update to copyright law makes it into law it will result in a $500 fine for Grandma and a $20,000 fine for Mom and Dad! The only saving grace is baby might be able to extract $20,000 from Grandma if she screened the DVD for her knitting circle. This is one of the many individual uses that generally considered fair use (dealing) in Canada that is being attacked by bill C-61, the proposed amendments to Canada’s Copyright Act. This bill is about protecting or creating failed business models and it is anti-consumer, anti-innovation, does little for actual artists (rarely the actual rights holder), circumvents the market and tramples on fair use/fair dealing while ensuring rights holders are entitled to extra revenue for content they’ve already sold to consumers transferring play-back devices. The same government that refuses to change the rules to protect Canadians when circumstances change are apparently willing to protect largely American owned rights-holders when circumstances change for them. Canadian consumers worried about unfair prices when the Canadian dollar overtook the American dollar ignored, Canadian workers in the finance minister’s home riding can’t even get a visit from their MP when their contract was violated, but when technology makes it hard for companies to enforce unreasonable contract restrictions the Harper government offers up a federal law to remove rights from Canadians. I wanted to first acknowledge the achievements Alexa McDonough has had in her carer and then point-out the the media-savvy that characterized her tenure as leader of the NDP: She announced her retirement on the same night as game five of the Stanley Cup series. Her feature interview on the CBC main network should run around 2:00AM EST – how fitting. You are currently browsing the iMatt :: The Blog of Matt Clare weblog archives for June, 2008 .